Vincent Borg Bonaci, a former Valletta FC and Malta international goalkeeper, passed away yesterday, aged 62, at Sir Paul Boffa Hospital. The burly Borg Bonaci, remembered by the fans for his robust style of play in the penalty area, earned a regular place in the Valletta side in 1964 following the departure of another City great of that era - Tommy Taylor. 'Censu' started playing his football with Valletta but moved to St George's before his return to the capital. With Valletta, he played until the early 70s when he decided to quit the game and make space for another future national team keeper, Alfred Debono. Borg Bonaci contested a FA Trophy final in 1970 when Valletta were beaten by Hibernians 2-1 after a replay. With the Citizens he won the Cassar Cup in 1966. In the final, Valletta beat Sliema Wanderers 3-1. He placed third in the Malta Sportsman of the Year Award contest in 1969 and was a serious contender for the Footballer of the Year title of 1969 which was eventually won by Hibernians' John Privitera. Perhaps his most memorable match on the international scene was with the national team on April 21, 1971. On that day, Malta played at the mythical Wembley Stadium against England in a European Championship qualifier. The Maltese lost 5-0 and Borg Bonaci was replaced by Freddie Mizzi during the match. In all, Borg Bonaci, born on December 11, 1943, played nine times for the national team - two World Cup qualifiers, three in the European Championship and four friendlies. This was the second death of a former Valletta FC goalkeeper in a space of a few weeks. Joseph Spiteri, iz-Zabu, passed away on July 26. 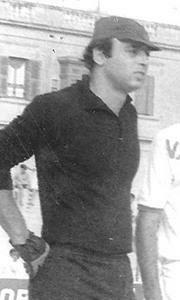 Spiteri won successive championships with Valletta in 1945 and 1946. Borg Bonaci's funeral will be held tomorrow at St Dominic's Church, Valletta, at 8 a.m.